NEW YORK, New York — Construction of the new kindergarten, designed for up to 50 children, will be completed in mid 2013 and the children of Sos will enjoy the modern and fully furnished campus. At present, crews are constructing the roof. The existing kindergarten is located in a 50 year-old building, which is in a state of serious disrepair. The community was in dare need of a new building. 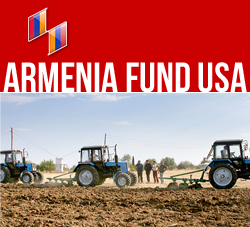 With support of the French- Armenian community and the Nagorno-Karabakh government circa two years ago, the village also receive critically needed potable-water through the reconstructed water network. The village lays along the Stepanakert-Karmir Shuka-Martuni road The Amaras monastery complex is located about 5.5 km from the village.